Each brand and model of air purifier has its own unique features, strengths and shortcomings. Honeywell’s 50250-S HEPA air purifier is no exception. It is packed with some great features, it’s a great value, and it has a few quirks. All of which we will cover in this review. However, when all is said and done, the Honeywell 50250-S round HEPA air purifier is a well-built air purifier manufactured by a very, very reputable company. The company behind the 50250-S is well known, and highly respected. The software and hardware they produce is found in everything from thermostats to military aircraft. And, they’re about as far from a startup as a company gets. Honeywell’s impressive track record spans more than 125 years. The secret to thier success; continue to innovate, invest in new technology, and create excellent products for consumers. Editor’s note: Our Honeywell 50250 S review was originally posted in August of 2015, and has been completely revised for accuracy, relevance, and in consideration of new developments in purifier technology. 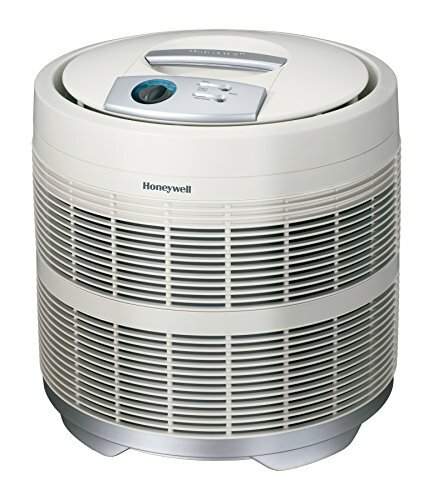 The Honeywell 50250-S is a top rated machine in the air purifying world. In fact for a handful of uses it’s one of our top picks. And, best of all, this machine is incredibly affordable considering the level of performance it provides. On it’s lowest fan setting we measured 58 dB from a position just above the purifier. Three different speed settings allow you to adjust the airflow as required. This means that you can dial things back to help with energy consumption, or cycle a high volume of air when the air needs a bit more attention. The three settings are low, medium and high. While some consider this machine a quieter option, others complain that it creates more white noise than than they’d expect. At its highest setting it sounds a bit like a run-of-the-mill box fan running on a lower speed. But at the purifier’s lowest setting it’s fine for sleeping or when you need a bit of peace and quiet. But don’t expect that it will compete with higher end units in the quietest air purifier category. It’s very difficult (and expensive) to eliminate the sound of a powerful fan. Most machines only facilitate airflow from just one direction. The 50250-S uses a cylindrical filter that provides 360 degree airflow. This increases filter surface area, efficiency and the rate cleaning the air in your home. Like the machine itself; filters and the activated carbon pre filter is both affordable and widely available. The Honeywell 50250-S features the company’s Intelli-Check™ electronic filter indicator. The filter indicator lets you know that it’s time to replace the filter with a fresh one. Which means you won’t have to keep track of the replacement date or manually inspect the element. This definitely makes maintenance on this machine far more manageable. HEPA filters usually last three to five years in this machine, whereas the pre-filters typically last roughly three to six months. The pre filter in this air purifier uses activated carbon to eliminate pollutants that are beyond the capability of a HEPA filter. The carbon provides a large surface area so it can trap as many contaminants as possible. It also traps larger pieces of debris and dust before they can clog the HEPA filter. Pretty smart, right? But we think the biggest benefit is its ability to remove smells like smoke and pet odors. Oh, and the pre filter can be vacuumed to extend its performance. But, to keep it in tip top shape you should really get a new pre filter every three to six months. The true HEPA filter is a medical grade air purifying filtration element. To be quite honest the long lasting HEPA filter is really the key to unit’s success. It removes 99.97% of airborne pollutants (.3 microns or larger) from a room. That includes particles that are invisible to the human eye. It’s pretty rare to see a true HEPA filter that lasts three to five years at this price point. And, like the pre filter, you can vacuum the element to help keep the clean air flowing. Though, eventually it will need replacement. As a point of reference, most HEPA filters in similar machines only last six to 12 months. Honeywell has done a fantastic job of cutting costs and helping the environment by making these long-lasting filters. The Honeywell 50250-S Round HEPA Air Purifier can handle up to 390 square feet at a time. That is the size of a fairly large living space like a basement, living room or a big bedroom. It quickly and effectively cleans and purifies your space. Unfortunately, because it requires airflow from all sides, it is not a good idea to put this air purifier directly against your wall. This may be inconvenient for people looking to hide their air purifiers in an out of the way spot. However, this minor flaw can be justified by the fact that the machine can provide clean air for such a large space. The Association of Home Appliance Manufacturers (AHAM) is a company that authenticates the volume, energy and performance of household appliances. The Clean Air Delivery Rate (CADR) recognizes the volume of filtered air emitted from a device. The Honeywell 50250-S is recommended by most doctors and allergy specialists. It has a CADR rating of 250 which means it is able to clean the air in a room up to 390 square feet 5 times in an hour. This score applies to smoke, dust and pollen. For the size and amount of space it can cover, this is an excellent score. Overall, the Honeywell 50250-S air purifier is an affordable and effective machine. The 360-degree airflow makes it a great option for larger spaces. It is a fantastic feature that helps with the CADR rating and extends the filter’s service life. The long-lasting true HEPA filters are also a huge plus. Most HEPA filters when run every day will typically work only six to 12 months before needing to be replaced. The HEPA filters in the Honeywell 50250-S only need to be replaced every three to five years. This significantly cuts costs for the consumer and produces less waste, making it a greener product. On the other hand, the power consumption does not make it the most energy efficient device. So, if you are looking for a quiet machine you can tuck in the corner, this is not the model for you. However, if clean air at a low cost is your top priority, the Honeywell 50250-S is a great find. However, if you need a bit more power and a lot more features; check out Air Mega’s awesome offerings. In 1885 inventor Albert Butz introduced what would eventually evolve into what we now call Honeywell International. But, the Honeywell name didn’t appear until 1927 when Butz combined his talents with a promising engineer, Mark Honeywell. The merger marked the beginning of a global enterprise. Today, Honeywell is a Fortune 100 company that thrives on creating innovative, energy efficient and environmentally safe technologies that improve the quality of people’s daily lives. Honeywell specializes in commercial/consumer products, engineering services and aerospace systems. The company builds products regarded around the world as well-designed, innovative machines. To further increase their ability to innovate Honeywell merged with General Electric another global powerhouse known for producing top quality products.